THE B-MOVIE NEWS VAULT: On April 24th, "The Greatest Hollywood Martial-Arts Movie Ever Made" Comes to Blu-ray! On April 24th, "The Greatest Hollywood Martial-Arts Movie Ever Made" Comes to Blu-ray! DARK FORCE ENTERTAINMENT GIVES THE PREDECESSOR TO "KILL AND KILL AGAIN" ITS BLU-RAY DEBUT! Until recently, I had never heard of Dark Force Entertainment. It would seem that they are a relatively new genre label (separate from, but aided by Code Red DVD) that will have the majority of their titles distributed by Kino Lorber (e.g. OFFERINGS). With a focus on cult Action and Horror titles, Dark Force's next major release is for KILL OR BE KILLED, a South African martial arts flick that made its way to the U.S. in 1980! Synopsis: This cult classic stars James Ryan (SPACE MUTINY, KICKBOXER 5, FROM DUSK 'TIL DAWN 2: TEXAS BLOOD MONEY) and attempts to capture the flavor of its '73 predecessor ENTER THE DRAGON. In this effort from South Africa, both Nazi and Japanese war criminals preside over an illegal martial arts tournament where various fighters battle it out to the death. KILL OR BE KILLED was originally released in South Africa in 1976 and then four years later in the USA to capitalize on the martial arts genre that was sweeping the country at the time! The film would then generate a successful followup (also starring James Ryan) five years later, called KILL AND KILL AGAIN! NEW! Fully restored scene by scene corrected HD master! Coming attractions from Dark Force Entertainment. 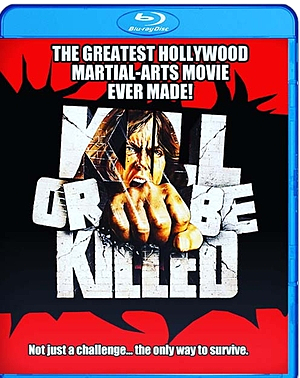 KILL OR BE KILLED arrives on Blu-ray on Tuesday, April 24th and is currently only available through SCREEN ARCHIVES ENTERTAINMENT for $24.95!